We discovered Millcreek Canyon in 2002. 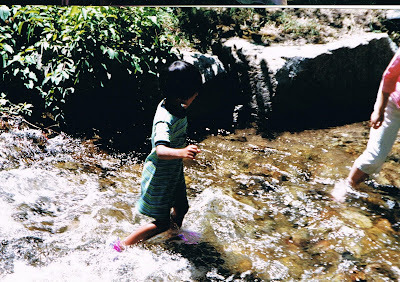 My littlest girls, age 5, loved playing in the creek and climbing the waterfall. My neighbor was the one who first took us there, and as we were leaving she told us the story of the Troll that lived under the bridge. My girls have talked about that Troll ever since. The questions just never stopped, until the Easter Bunny forgot his candy in our cupboard, and then everything changed. 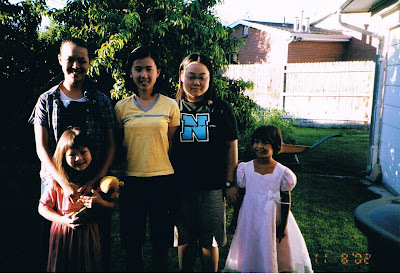 The same year we discovered Millcreek, we sponsored some students from China for a week. We took them to Millcreek, but I can't seem to find those photos (more than the leg in the above photo). When Grace and Violet climbed up the waterfall they became too scared to climb down. I had to send the twins up to help them get down. It was a very big ego booster for the twins. I have that episode on a video tape, but not on digital - yet. I love this photo of my girls with Grace and Violet in our backyard. We were all so young.